Location: 5th St @ Market in San Francisco, Ca Artist: Apexer. Deb. Dirty Bandits. 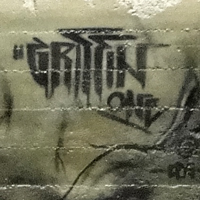 Elle.Griffin One. Mike Tyau. Pemex. Steiner. Buff Monster. Location: Brannan St @ 3rd in San Francisco, CA Artist: Griffin One. CBS. Photographer: WestByMidwest. The is one of 14 photos of the Lords Production. Go to blog article with same name to see all the writing. Location: Erie Alley @ Folsom St in San Francisco, CA Artist: Griffin One. CBS. Manos. Location: Sycamore @ Valencia Street in San Francisco, Ca Artist: Griffin One. Location: Telegraph Ave in Oakland, CA Artist: Griffin One CBS. Photographer: Graff Hunter. Location: 30th Street @ Peralta in West Oakland, CA Artist: Griffin One. Photographer: West by Midwest. Griffin is a fusion of street artist, fine artist & mixed-media designer, based out of Oakland CA. His graffiti & street art roots stretch back to the early 90s, and throughout his journeys and the different cities he’s lived & explored, he has developed a unique style and span of many mediums & themes. When he is not creating his own works in the studio or painting murals, he collaborates with a diverse span of music producers, artists, creatives, grass-roots organizations, and other client-collaborators in North America and abroad. His work can be found in galleries, with private art collectors, to large walls all over the world. Much of his work often incorporates a fusion of elements from our modern technological age with motifs from the old world, whether it's through his lettering, character driven pieces & or more abstract works. Through his art, we catch a glimpse of the world of Griffin One, a unique surreal illustrative style, that is like no other!